and the third leg is made up of all the co-texts, the other things that are said or happen around the particular passage. Because it’s only when we bring all three legs of that stool together that the full meaning of the biblical passage emerges. To put it another way, when we ignore one of the three legs, when we only read the text and ignore the context, when we cherry-pick a text as if it had no co-texts, then we can be sure that our reading will be unsteady, our interpretation wobbly and our take on the passage likely to come crashing down. To find out what happened yesterday when Michael Paterson invited us to sit on the interpreter’s three-legged stool to consider Mark 10.2–16, and the reason for our hymn-line title, you’ll have to go to this link! 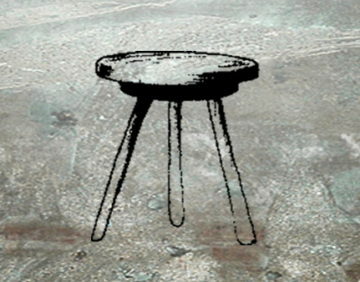 Acknowledgement: our three-legged stool comes from a Christward Collective blog.